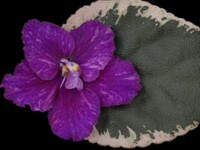 Standard African violets are those that typically grow to more than 8" in diameter at maturity. 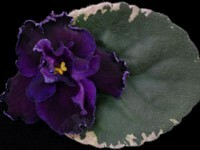 Dark red, single and semidouble pansies. The standard foliage is plain, medium green with white variegation, mostly on the leaf edge. Alluring! 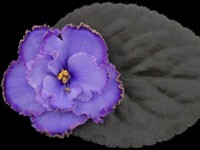 Medium purple, single and semidouble star with a frilled geneva edge accenting each petal. 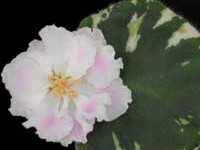 The medium green foliage has beige variegation on the leaf edge and is quilted. Standard. 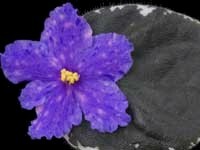 Very large, double stars of medium purple, with a thin white outline on very frilled edges. Raspberry fantasy flecks playfully decorate the flower face, and occasionally, blue streaks also join in. 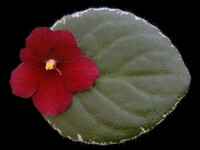 The standard foliage is large growing, dark green, with a red reverse, and quilted. If pinks are your color, then you'll have to add this one to your collection! 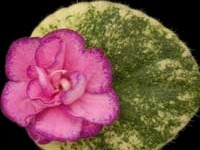 The medium green standard foliage is heavily variegated with a soft pink blush, mixing with beige and ivory, stunning! The medium pink double stars are surrounded by a fluted edge. The plant shapes very nicely. 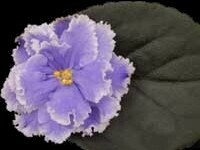 Semidouble, deep blue-purple, with frilled edges; white and pink, wavy, variegated foliage, standard. Semidouble, fringed, rose pink, darker edges; white and pink, variegated foliage, standard. Semidouble, wavy lavender, darker upper petals and edges; white and pink, variegated foliage, standard. 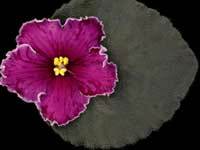 Semidouble, deep velvety purple, frilled white edges; white and pink, variegated foliage, standard. 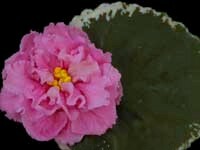 Double pink ruffled, frilled/raspberry top petals. Variegated green, white and pink, standard. 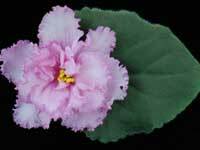 Semidouble, magenta, frilly green edges; wavy, white and pink, variegated foliage, standard. 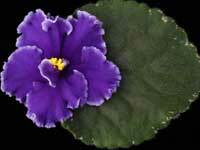 Very dark purple, single stars, with a heavily fringed, green edge. 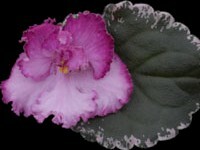 The standard foliage is variegated, with beige on the leaf edges, is dark green with a red reverse, and lightly ruffled. 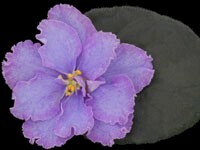 Single and semidouble stars of medium blue, with lavender hues radiating out from the center of the bloom. 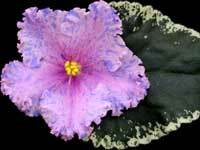 Puff fantasy spots of pink and fantasy spots of darker blue cover the flowers of this exciting cultivar. Foliage is medium green, with variegation mostly around the edge of the leaf. Double, light blue ruffled large star with a wide white edge. Dark green foliage, ruffled with red backing. Large Grower. Light coral/pink single stars which are slightly cupped. 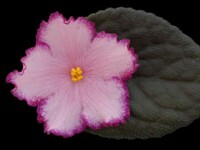 A darker blush shows up in the flower center and occasionally, darker coral fantasy spots are on the flower face. 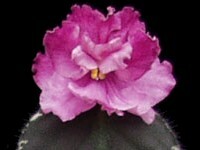 A very dark, raspberry edge, outlines the slightly fluted flower. The dark green, standard, tailored foliage, shapes nicely. Semidouble and double pink flowers with a glittery fuchsia edge. Champion type variegation of light yellow, beige and medium green adorns this standard growing plant. Magnificent semidouble, frilly, fluted and wavy petals of two-tone rose-pink, combine with deep rose feathering on petal edges, accented with a narrow, broken, faint geneva edge make these stars so eye-catching. 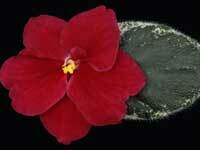 You will adore this cultivar with dark green, large growing show foliage, that sports a red reverse. 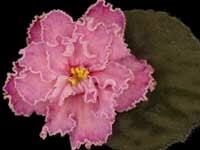 Huge, double, medium pink stars, with a heavily fringed dark pink edge. The standard foliage is dark green, slightly wavy and quilted. 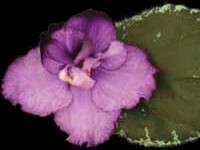 A sport of Magic Charms, this plant is a loving tribute to Lyndon Lyon's daughter, and Paul's mom, Betty Sorano. 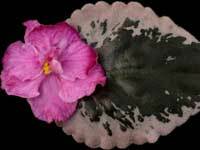 Purple, single and semidouble pansies, are spattered and streaked with tiny, medium pink fantasy, like sparks from a fire! Tailored, dark green, standard foliage is variegated in ivory on the leaf edges. A more subdued color red, perhaps a little closer to a "true" red. 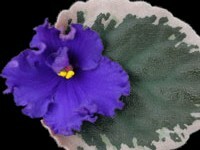 The pansies on this variety bloom as semidoubles, and have a sporadic light pink edge. The dark green, slightly cupped foliage is heavily variegated with beige. Compact standard.